27" RGB Colour monitor which supports PAL/NTSC modes only. It also has both composite and Y/C inputs, mono audio and a 181 channel tuner and also includes a remote control. Only one input cable should be used at any time. First, the Input Select switch on the back of the monitor must be in the "DOWN" position. Second, the S-Video input must be selected via the on- screen menu. First, the Input Select switch on the back of the monitor must be the "DOWN" position. Second, the AUX/VCR input must be selected via the on- screen menu. AMIGA OR RGB INPUT: First, the input select switch on the back of the monitor must be in the "UP" position. Second, S-Video must be selected as a input via the menu display. Depress the menu (-) down button for the on-screen display. Note: you may want to disconnect the DB9 cable because the menu display is shared with the RGB input. Use the menu (+/-) buttons to locate the source input. Use the volume up (+) or volume down (-) to select S-Video (Y/C) in. Use the on-screen menu to select aerial input. If you have cable, you will have to select the cable "Yes/No". The monitor has been programmed to automatically display the Y/C input (RGB overrides). To change use the ON CHANNEL menu display for the Power On channel for a different input. The display menu will disappear after (1) one minute of non-use. You can also remove the menu display by selecting EXIT in the menu. Also, the input select switch should be in the down position. Remember the input select switch on the back: UP for Amiga/RGB input and DOWN for Y/C or Composite Video. Also remember only (1) one cable can be con- nected to the monitor at any given time. If the image has a cross pulse, double image or looks like there is no sync while in the Amiga/RGB mode, remove the Y/C or composite cable. 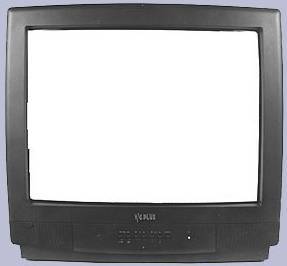 If there is no color in the Y/C or Composite Mode, select the correct in via the display menu S-video for Y/C or AUX/VCR for Composite Video. If there is no Picture in the Y/C or Composite mode, position the input select switch to the "DOWN" position or remove the Amiga/RGB cable. If there is no Picture in the RGB mode, be sure the input select switch is in the "UP" position.